Former pro player, C.J. 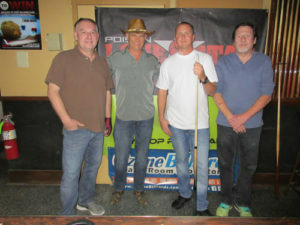 Wiley, captured the inaugural, Poison Lone Star Billiard Tour Dallas 9-Ball Open, overwhelming California’s Tim Larson in the final sets, 6-1, 6-1. Wiley, a former world-ranked, pro player faced off with hot-seat winner Larson, a Redding transplant, now calling Aubrey, Texas, “home”. With style and grace, a seasoned Wiley closed out the final sets, winning his first Poison Lone Star Billiards Tour title, in the final event of the 2017 season. “Thanks” to all the players who competed in this inaugural event, and who compete on the tour, year round. The tour ended its ninth year in a blaze of glory, playing host to some of the best pool talent Texas has to offer. Attendance at this event boasted Robert Clark, Justin Whitehead, T.J. Davis, Forest Boyd, Daniel Herring, Danny Williams, and over 40 others, who competed for nearly $5,200 in cash, and the title “Dallas Open Champion”. The tour would like to extend its deepest thanks to its sponsors for another phenomenal year of pool. 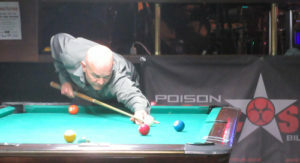 This year, the tour hosted several “single division”, open 9-ball events, and added some new, host rooms, to their annual roster. 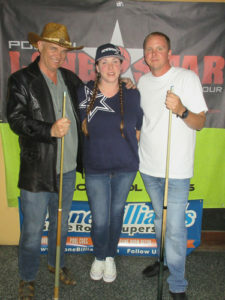 CK Billiards and Sports Bar hosted its first Poison Lone Star Tour Event this year. The room featured quality equipment in a non-smoking environment, desirable amenities for most players. Play ended early on Saturday evening and brought back the final twelve on Sunday. On day one, Wiley shot through Mitchell Owen, 6-2, Chris “Woody” Smith, 6-5, and Danny Williams, 6-2. Also on their way to the final four, Forest Boyd ousted Robert Franco, Jason Judd, 6-1, and Robert Clark, 6-4, while Tim Larson took down Carl Honey, 6-5, Chuck Adams, 6-4, and Eric Terry, 6-0. Justin Whitehead rounded out the final four on the winners’ side with wins over Albert Pedraza, 6-1, Brandon Welch, 6-1, Brian Humphrey, 6-4, and Daniel Herring, 6-4. On the one loss side, after losing his second match to Clark, 6-4, local champ, T.J. Davis won an incredible eight matches, which included wins over Blas Andrede, 6-1, Humphrey, 6-0, Judd, 6-3, and Williams, 6-2. Amos Bush made headway on the west side, eliminating Chris Valdez, 6-1, Noel Villalobos, 6-2, and Guerrero, 6-3, but was stopped by Clark, 6-4. West side action also witnessed Juan Parra oust Welch, 6-3, Juanito Gallegos, 6-2, and Gerardo Perez, 6-5, until meeting his fate with Eric Terry, 6-3. Rounding out the final four, Smith ended Scott Spiegel, 6-1, Olsen, 6-3, and Herring, 6-4. Back on the east side, Larson overcame Whitehead, 6-3, and Wiley bested Boyd, 6-1. What some deemed an upset, hot seat action witnessed Larson overpower Wiley, 6-1, while Davis continued his reign on the one loss side. Davis ended Clark, 6-5, and Whitehead, 6-3, while Smith dusted off Terry, 6-3, losing in turn to Boyd, 6-5. Davis went on to crush Boyd, 6-2, until his run was stopped short by Wiley, 6-2. Wiley earned his way back to Larson, and a shot at redemption. As the first set got underway, Larson expressed some frustration with his rolls, and Wiley capitalized. In a seemingly effortless way, Wiley cruised to a 6-1 win, both sets, to claim the Dallas Open title. Congratulations to Houston’s Brian Humphrey who took home a Poison VX Jump Cue, and a set of Cyclop Pool Balls, in the weekend raffle. The tour would like to thank its 2017 venues for all of their continued support. The 2018 schedule will be published at www.LoneStarBilliardsTour.com. Be on the lookout for information about our 10th Anniversary Event!